The biggest baddest healthiest salad on the planet! It consists of raw organic vegetables, sprouts, seeds, nuts and homemade dressing. 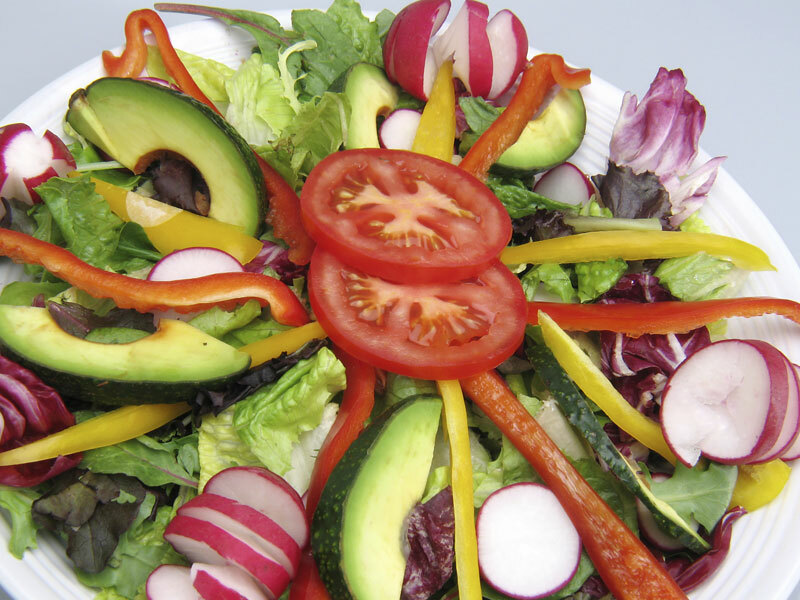 This salad is super healthy, delicious and will fill you up without zapping your energy. The raw vegan diet was a huge part of my anti-cancer strategy and I ate this salad every day, sometimes twice a day, during the first few years of my chemo-free cancer battle. I wanted to put as many vitamins, minerals, nutrients and enzymes into my body as possible and there’s no better way than juicing and eating fresh raw organic fruits and vegetables. Absolutely no cheese, meat, fruit, or store-bought salad dressing. It is important that you use organic produce, which is free of toxic chemical fertilizers and pesticides. And of course wash everything before you eat it. Then just chop it all up and throw it in a bowl! Note: You’re gonna need a bigger bowl. -I like to start with some dark green lettuce: Arugula, Spinach, Baby Romaine, Kale, Mache, etc. Most folks think of salads as a bowl full of lettuce. I’m light on the lettuce, heavy on the vegetables. -Other Sprouts: Alfalfa, Brocco, etc. Bubbies is made with only three ingredients: cabbage, water and salt. It is fermented and cured with all natural enzymes intact and there is no vinegar added. (Bubbies Kosher dill pickles are super tasty too. )Look for it in the refrigerated section of your local grocer or health food store. Kimchi is a spicy Korean version of sauerkraut typically consisting of fermented cabbage, onions, garlic, and pepper. Kim Chi has high concentrations of Vitamin C and Carotene in addition to Vitamin A, B1, B2, Calcium, Iron and beneficial lactic acid bacteria. Recognized as one of the Top Five “World’s Healthiest Foods” by Health magazine. Also in the refrigerated section. Repeat: Absolutely no cheese, meat, fruit, or store-bought salad dressing. Fruits and vegetables need different digestive juices, and when eaten together can create excess acid and indigestion, and internal acidity promotes disease. That is why they should be eaten separately. This even includes non-sweet fruits like tomatoes. If you want to know more, there are entire books devoted to the subject of food combining . This is hands down the healthiest salad dressing on the planet! I can’t tell you many times I have eaten this salad! Over a thousand I bet. And what’s funny is I have several books filled with of raw vegan meal recipes, but the Giant Salad ended up being my staple meal. Most days I ate it for lunch and dinner. I didn’t care about eating the same thing every day, because it was simple and quick to prepare. I didn’t have to put much time into planning my meals and it’s so delicious and full of flavor it never got old! Watch a video of me making this salad and salad dressing HERE. check out The Raw Gourmet by Nomi Shannon. Subscribe to my blog to receive instant email notification of new posts! i’m just wondering why you have tomatoes pictured on your salad when you said not to eat fruits and non-sweet fruits like tomatoes together? and did you put all the veggies in the list above on a salad, or just a few? there is no way i could eat a salad that huge in one sitting! Hah yeah! Cindy I’ve been waiting for someone to notice that! This is an early post and that is the best salad picture I could find online at the time. I do put them all in the salad and it’s huge! Hence the name. every day. Watch the video I posted and you’ll see how I do it. ok i get it! you didn’t make that one. that explains the radishes (you didn’t even mention those:) and other stuff missing from the salad that is on your list. sadly i cannot watch your video; i have dial-up, i have not downloaded updates ever, and there is a ton of spyware on my machine. i had stage 3-c colon cancer in 2008. the tumor was on my right side. surgery and 9/12 chemo treatments then more surgery to repair a hernia. i got my yearly c.a.p ct scan last wednesday and my onc told me thursday that while my abdomen and pelvis came back ok there are spots on my lungs that were not there last time. they are very small so she referred me to a pulminologist whom i’m seeing this coming tuesday. if they are tumors, i cannot imagine doing chemo again. at least they are very tiny and maybe it’s nothing. i am enjoying reading past blog posts, some have made me curious so i do some research on my own, like the one on the farmed fished. i found the pure salmon campaign site and holy crap! seems like nothing is safe, esp. when your fighting cancer! Hey Angee, I really don’t eat it any other way. But it does sound good with noodles now that you mention it. I’ll have to give that a try! I KNEW IT! Kimchi!!! I am half korean and I LOOOOOOOVVVEEE KIMCHI!!!!!! I’m so glad I don’t have to give it up!!! I find the simple meals to be the most satisfying. I too, purchased many raw food books, read raw blogs, etc. and still, a nice salad, green smoothie, veggie platter, nut butter sandwich on sprouted grain bread, that’s what I live on. The kelp noodles are pretty good, and I’ve made some great meals with those. Good for you for doing all this! Question, where you a vegetarian before you started your diet shift? I was, so I think that made it easier on me than most. Shanna can you send me some recipes with the kelp noodles? Please? Im trying this vegan thing. It’s not easy since Im so not used to eating veggies. But never fear Chris! LOL Im trying! Im gettng there I promise. Enter your email address to subscribe to my blog and get a steady stream of super healthy awesomeness straight to your inbox! Salt. Not the movie, the mineral. Subscribe to chris beat cancer! Enter your email address to subscribe to this blog and get my new posts sent straight to your inbox.